our new drink is a tasty one. even though the weather in most parts of the country is nearing winter, out west, its still hot as can be. 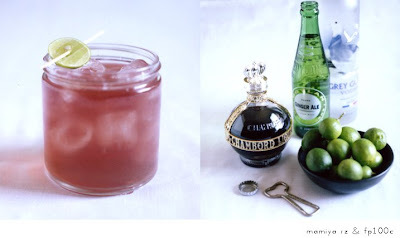 so here is a cool you down cocktail that can be enjoyed any time of year. we made this with vodka, but if your a gin person, it will work as well. using top shelf vodka is always a must. and this drink really tastes better if you can get your hands on a nice bottled ginger ale. we used boylans, and its make such a difference. YUM! I miss you guys! I made this recently with lemons instead of limes and it was delicious.